Thankfully over the course of the weekend the needless posturing that followed Eduardo’s horrific leg-break against Birmingham seems to have settled down. The thoughts of Pies and every right thinking football fan are with the little Croatian-Brazilian as he battles to save his career. I have watched the stomach-churning footage of the incident a few times and it is clear that Martin Taylor did not intend to inflict the injury on Eduardo. Taylor was just too slow (or Eduardo too fast, depending on which way you look at it) and while his challenge was clumsy and reckless, it was not malicious. It could have been so different if Eduardo has just managed to jump out of the tackle or even not had his foot planted so firmly in the ground. Arsene Wenger’s comments about Taylor being banned from football for life – which he has now retracted – were absurd. The Birmingham defender was visibly disturbed by his terrible mistake and showed instant remorse. Sadly these things do happen from time to time in football. The incident brought back the sickening memories of David Busst’s career-ending leg break against Manchester United. It didn’t make for pretty viewing, but it was just a horrible accident. Do you agree? 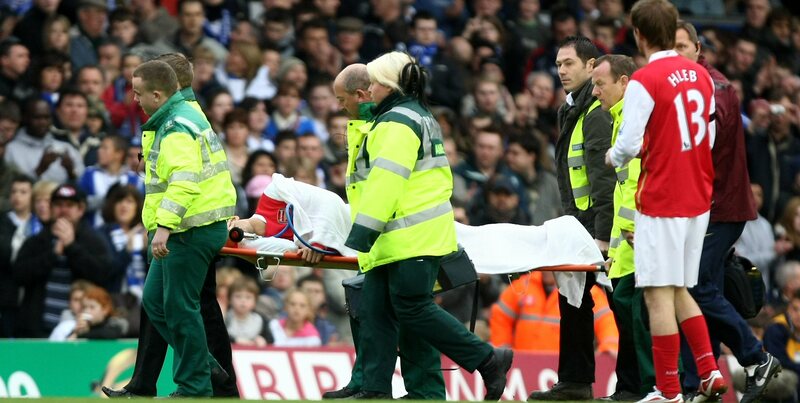 After the jump is a video of the incident and a photograph of Eduardo’s injury. A lot of the mainstream media have, perhaps understandably, avoided the footage showing the full scale of Eduardo’s injuries but I think it is important to see exactly what we are dealing with here. If these images are likely to offend you, please do not click Continue reading.